For best Branson vacations one call takes care of it all! Just a few of the many choices Branson visitors have. The Branson Tourism Center has been helping Branson Visitors plan exceptional vacations since 2002. “‘Helping people have the best possible Branson experience,’ is not just a trite phrase. It describes the passion and commitment of our 100 Branson based employees as they share all Branson has to offer each day,” Preston adds. 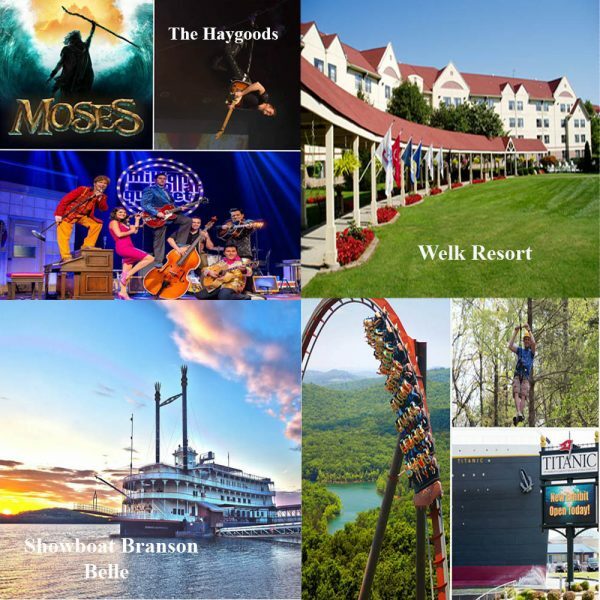 One call to 1-800-785-1550 puts you in contact with one of Branson Tourism Center’s Branson-based Vacation Specialists. They’ll help you to narrow all the choices Branson has to offer into the perfect vacation for you and your family. There is absolutely no fee or charge for this service. The Vacation Specialist will guide through the 20,100 hotel rooms, condos, and cabins available to come up with the one that is ideal for you and your family. Do you want a lake side cabin, condo, or room? Do you want to be near Silver Dollar City? On a golf course? Pet friendly or not? Are there particular amenities or services wanted? What price range? Want the lowest guaranteed price on your lodging? No problem, just select lodging that is part of the Branson Tourism Center’s Lowest Rate Lock Guarantee Program. These include properties such as the Welk Resort, Dutton Inn, Pointe Royale Resort, and others. Subject to a few conditions, if you find a lower price for the same room on the same dates, between when you book and arrive in Branson, the Branson Tourism Center will match it. Branson’s shows are famous! From over 120 shows, as varied as Moses, Million Dollar Quartet, Presleys’ Country Jubilee, and Amazing Pets, the Vacation Specialist will help boil it down to those that most interest you and your family. They will also show you how to save money by bundling lodging and shows and using Family Passes. “And that’s just shows and lodging! As with them, there are similar choices within each of the general categories of things to do in Branson. It’s not just a “lake” there is a choice of three. Do you want to fish for warm water fish like bass and crappie or cold water species like Rainbow and Brown Trout? How about zip lines? Do you want a full guided eco canopy tour across many zip lines, platforms, and skywalks like that offered by Branson Zipline. Or would you prefer the unique thrill of zipping across Lake Taneycomo to the top of Mount Branson for a spectacular view of Branson Landing and Historic Downtown Branson on Parakeet Pete’s zip line? From rooms, to shows, attractions and other activities, your Branson based Branson Tourism Center Vacation Specialist will help custom design the perfect Branson vacation for you and your family. At the very least they will save you valuable time and, in most cases, money. Most important of all however, is that they’ll help plan a Branson vacation that could make memories lasting a lifetime! This entry was posted in Branson Attractions, Branson Lodging, Branson Shows, Featured on February 17, 2017 by Gary Groman.